Freshwater Snails is indeed a site to behold in a fish tank. They are usually added to a fish tank as tank cleaners with the intention that they will be eat algae and also free the tank from uneaten food, dead plant matter and debris. However, freshwater snails can be much more than that. They do several stunning things in the tank and exhibit a number of interesting behaviors to watch. They can however be seen as pests when they are introduced to the tank by accident. When it comes to freshwater snails, it’s critical to avoid causing sudden changes in water parameters. This is because the freshwater snails are very sensitive to sudden water parameters changes and it may be fatal. In the case of food,freshwater snails should be fed a diet rich of calcium. They need calcium for growth as well as for healthy shells. Assassin Snails: this is the type that is kept for taming the populations of other snail types in the tank as they feed on them. They feed on other snail types such as Malaysian Trumpet Snails, Pond Snails, and Ramshorn Snails. Gold Inca Snails: these are very good tank cleaners and they are very popular. They can also greatly improve the beauty of the tank, thanks to their bright yellow shells. popular type of freshwater snails in pet store display tanks are Gold Inca Snails. They can however be ferocious eaters and are always on the prowl for a bite to eat and are very interested in soft algae buildup on hard surfaces. The main setback for this type of freshwater snails is that some of them feed on live aquarium plants. Ivory Snails: these are freshwater snails with creamy white colored shells and they blend well in a community. This type of freshwater snails, just like Gold Inca Snails, like scavenging the tank for uneaten food, dead or decaying plant matter and soft algae on hard surfaces. They feed on fish flakes, algae wafers, tablets, pellets and even some blanched green and leafy vegetables. Japanese Trapdoor Snail: this freshwater snail type is calm, peaceful and non-aggressive in temperament and it can spend hours at the bottom of the tank scouring for uneaten food, debris and soft algae. They derive their name from their operculum that serves as the “trap door” that seals their shell aperture should danger suddenly arise. Mystery Snails: These have shells that are generally on the dark side, with light brown and dark brown accent colors and stripes. Others may have ivory white shells. Their color patterns are unique and nearly limitless. They make great tank cleaners, feeding on a diet of uneaten food, and dead or decaying plant matter but they also like supplements of bottom feeder tablets, pellets, algae wafers and fish flakes. These freshwater snails are notorious escape artists, so it’s very important to keep tanks covered to the extent possible. If there is a way out of the tank, the odds are Mystery Snails will eventually find it. Nerite Snails: this is the best algae eating freshwater snail type. They spend a lot of time methodically travelling across aquarium glass and other hard surfaces searching for soft algae buildup that they eat in small bites. Their popularity is due to the fact that they do not reproduce in freshwater aquariums and overrun a tank like the rest. Pond Snails: these end up in tanks by accident. They can be pets or pests, depending on the keeper. Rabbit Snails: this is a peaceful, non-aggressive slow moving freshwater snail type that can help keep tanks free of uneaten food and debris. They have very intriguing look, and they can reproduce in fresh water. 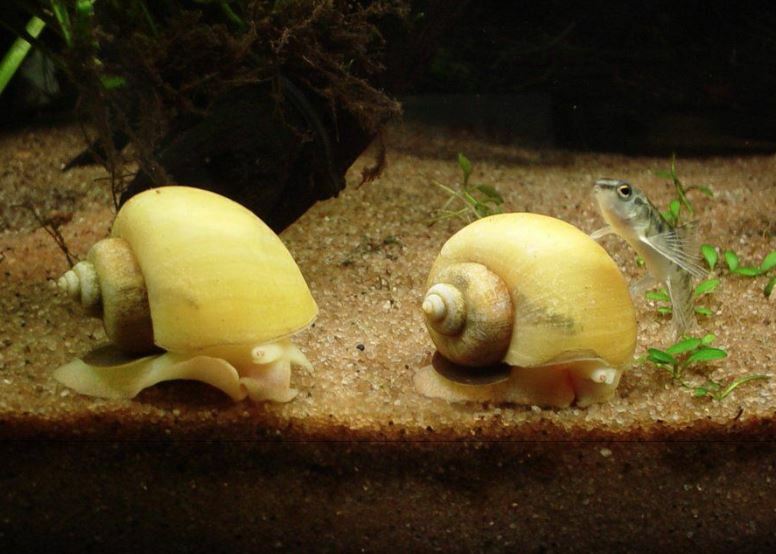 Ramshorn Snails: these lay eggs, reproduce in freshwater, and can quickly overrun a tank. They can be considered as a pet or a pest. Freshwater snails are the best fish tank cleaners.